Man this movie knows how to get your attention, coming at you hard and fast in the opening credits, leaving several bodies in its wake. The slickness of the production had me a little excited straight away, and all the lawless, dystopian elements look pretty promising. As quickly as it burst on to the screen, however, the movie transitions to a basic siege narrative, involving forced evacuations and a sinister government project. Don’t get me wrong, it’s still a fun, trashy ride, just watch out you don’t do a Meatloaf like I did. Dead End City is Peter Yuval’s first project as writer and director, having started out, and more or less continued, as a producer on classics like Killer Workout and Mankillers. I wasn’t sure how this creative debut would go, but throw in Robert Z’Dar and a cheesy, pulsing, synthesiser score, and the whole thing comes out looking pretty sweet. The adrenaline pumping, opening scene sees a dystopian bikie gang, The Ratts, rolling around a rundown neighbourhood. It’s dark and exciting, and they’re shooting everyone on sight, all the while titles cut slickly in and out. Did I mention that one of the shooters wears a scarf, a studded blazer, and rides in a sidecar – of course that’s the legendary Z’Dar. The gang clearly runs with reckless abandon, and is the reason police are forcibly relocating the citizens of wherever we are, under martial law. It’s a bit of a mysterious, chicken-or-the-egg scenario though. Our main man Jack Murphy, Greg Cummins, gets mixed up in this when his daddy’s factory is included in the latest round of evacuations. He can’t possibly leave, it’s all he has – never mind that he’s putting his friend, his crush-bearing secretary, and her blind brother, in mortal danger. 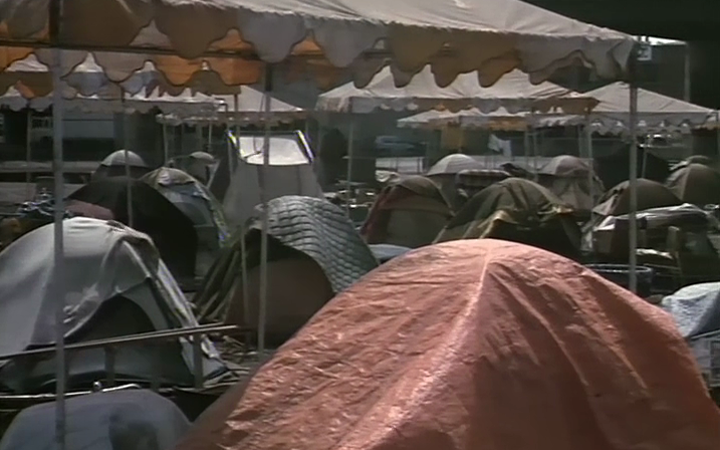 In Jack’s defense, evacuated citizens are being dumped in refugee camps of the Hotel California variety, which look shots of actual refugee camps by the way. Then again, if they stay they get shot at, by bikies and police alike. You see, Jack and his buddy Brett, Durrell Nelson, have also drawn the wrath of Ratts leader Maximum, Z’Dar – by turning down the wrong alley or something. Fortunately, Jack is a man with a plan, well, if you call holing up in the factory and fighting off the onslaught of murderous bikers a plan. Thanks to an impassioned and hugely cliché speech, complete with rising score in the background, Jack convinces his merry bunch to stand and fight with him. Luckily, Brett is a gun lover and lends his arsenal to the cause, which becomes a constant point of struggle. Sensibly they have Malcolm, the blind guy, Rob Wuesthoff, load the guns while they go on look out. The siege apparently quickly becomes a beacon of hope, an inspiring tale of resistance against both the police and the gangs. This sees Perky reporter Opal, Christine Lunde, get her crew caught in the factory while chasing the story, finding themselves stuck alongside our heroes. The number of the group fluctuates for the remainder of the movie, with fresh meat coming in off the street, and others getting tragically, but unsurprisingly, shot. Like I said, it’s a pretty basic siege narrative, flavoured with some mildly intriguing subplots, and spiced up by the mildly interesting characters. Greg Cummins – who had been in some wonderfully silly action flicks prior, and wound up in It’s Always Sunny in Philadelphia – plays it pretty cool as Jack. You don’t really care about him, but you’ve got to respect his ballsy, read stupid, decisions. I genuinely cared a lot more about the poor, enamoured Nancy, played by Ally Downs, who was making her way to stardom as a minor player on Days of Our Lives. Whether due to good acting, good writing, or good beer, Nancy was a lovely character, complete with dependent brother, and I just wanted her to be happy. Yet Jack, in his unexplained ignorance, goes gaga for Christine Lunde’s reporter and her satin shirt. Lunde had previously worked under Yuval on Mankillers, and later went on to work with Amir Shervan, what a lucky girl. Z’Dar – also someone who’s worked with Shervan – is here looking imposing, unhinged, and kicking arse as the alpha male of The Ratts. I’m not sure it’d be a watchable movie without him. I should also mention that 70s TV heartthrob Dennis Cole – father of murdered Black Flag roadie Joey Cole, for those interested – has a respectable turn as sinister police chief, Felker. Accross the board, the talent on Dead End City is pretty damn decent, I don’t mean Oscar winning, just better than average for the kind of movie it is. I mentioned the production value being quite high, particularly for what seems like movie with a pretty low budget, and the crew seem to have really pulled their weight. 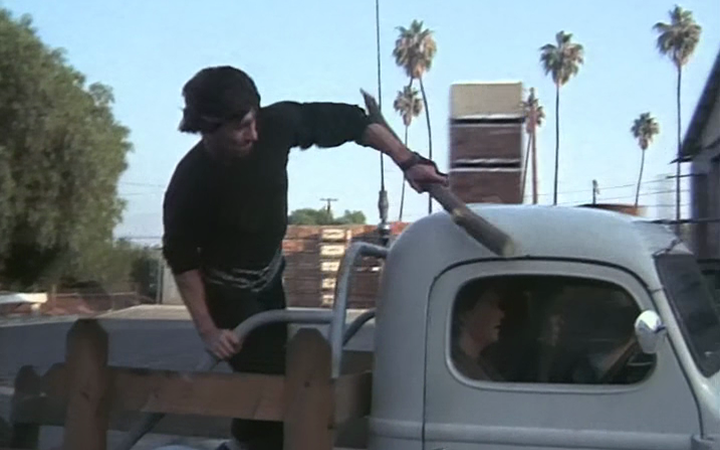 The whole lawless zone thing comes off well, with the sets looking drab and dystopian enough, and the Ratts rolling around causing wanton destruction under cover of night – even attacking cars with logs. The special effects, of bullets flying and cars exploding, work fine, and the costuming is basic but appropriate, Z’Dar in particular looks both ridiculous and cold-blooded. Perhaps most importantly, there’s some decent camerawork by Paul Maibaum, and some very solid editing by David Khachatorian, combining for some pretty slick sequences. The only real let down of the movie is that the story doesn’t power through and bring us more excitement, instead opting to rip off movies like 1990: The Bronx Warriors, although probably not intentionally. That said, Yuval occasionally outdoes himself with the dialogue – “Nice day for a drive.” “Nice day to die” – causing the actors to fumble hard. Fortunately, there are copious, raucous shootouts to keep you entertained, backed by Brian Bennett’s derivative, yet fitting, synthesiser score. With such a brutal opening, and a consistent amount of scrappy action from that point on, Dead End City is an entertaining watch. The setting works, even if it is a little dull, but the constant shootouts and chases make for an enjoyable, daft, and mildly pulse-raising ride. The actors, spearheaded by hardworking, low budget legend Robert Z’Dar, carry the rather bland story and add a little intrigue. Although Cummins could work on his chemistry – “it’s a nice neck.” The production is slick, almost unbelievably so for the kind of budget Yuval would have been working with, and, strange sound effects notwithstanding, everything comes together well. It peaks early, with the explosive, off the wall, opening sequence really knocking it out of the park, but stick around because the rest is still pretty action-packed. Previous: Previous post: Slave Girls from Beyond Infinity (1987) – To infinity and beyond!